New to using your HDPVR? Here are some quick and easy ways to use your PVR to record your favourite shows and movies. Learn how to use our smart recording feature and set a single program or series PVR recording so that you can enjoy your favorite shows and never miss an episode. When scheduling, the PVR starts at the highest priority event and works down to the lowest priority event. "Smart" recording events can shift in the event of a conflict, whereas "Impulse" (one-time), PPV, and auto-tune events cannot. All recording events will always honour the criteria you’ve specified, even if it creates additional conflicts or prevents things from being recorded. A smart recording event looks for the earliest airing that meets the event criteria. In the event of a change to the recording schedule, it will automatically adjust to attempt to record as much as possible, according to your parameters. By setting smart recording events, your PVR has maximum flexibility and will work to record as much as possible, subject to the parameters you have set for each recording event. For example, if allowed by the "Channels" setting, your PVR can automatically switch to a later airing on a timeshift channel to capture as many programs as possible. By customizing each event and confirming the outcome in "PVR Upcoming", you can ensure that exactly what you expect will always be waiting for you in your PVR list. Press the red RECORD button at the top right of the remote control. A new screen will appear with: "Do you want to record this program?" Use the right arrow key on your remote control to highlight yes and press ENTER. The recording screen will disappear and you will see a pop-up in the top right-hand corner of the screen that says: "Started recording". Note: If you have Live On Disk (LOD) enabled on your receiver, the entire program from the time you tuned in will be saved. LOD is enabled by default. In your guide or via search, highlight and press ENTER on the future program you wish to record. The options will vary depending on whether you’ve selected part of a series or an individual program, such as a movie. 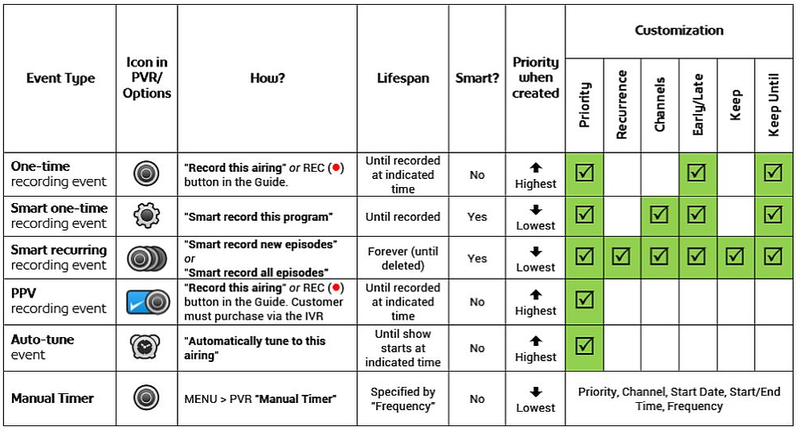 Smart record – Selecting these options allows the receiver to reschedule recording events if they get pre-empted by other recordings or adjusted by the broadcaster. Record this airing – This will record the program at the time selected unless it gets pre-empted by something of a higher priority. Automatically tune – This option will cause the receiver to tune to the airing but not record it. You will see a scheduling bar at the bottom of the screen and a grey circle icon will appear on the program once it has been scheduled. Information about the status of the recording will be displayed above the program description. How do I cancel the PVR recording? Once a recording has been scheduled you have two different options to cancel the recording. Press ENTER on the selected program in the guide and choose "Do not record". Under "Recording Options", choose the recording you wish to change or cancel. To access the "Recording Options" screen, press MENU on your remote, select "PVR", and go into "PVR Options". How do I know my show is recording? If you have an HDPVR 630, there will be a red "REC" light illuminated on the front panel of the receiver (two if you are recording two programs). In the Guide or while tuned in you will see the red recording icon beside the show. You can press "PVR" on the remote to view your PVR list. When sorted by the default, recordings currently in progress will appear at the top of the list.